Arsenal have received a massive injury boost with the return of three of their previously injured players ahead of the Huddersfield clash this weekend. 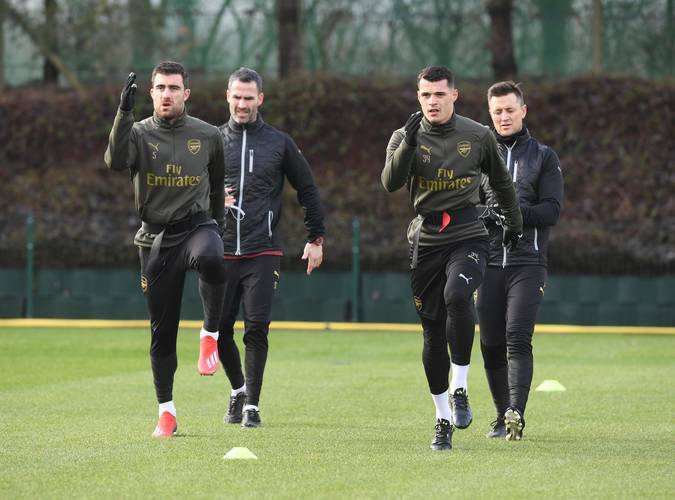 Shkodran Mustafi, Sokratis Papastathopoulos and Granit Xhaka have all resumed training though it's been the light type for the last two. Mustafi, the subject of a possible summer exit from the Emirates, was taken off late in the 3-1 defeat to Manchester City last Sunday as a result of a back injury which from all indications was a minor one. 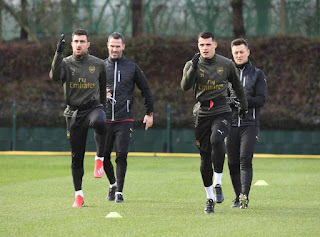 Unai Emery hoped it would end up as it seemed and thankfully, the German has made a quick comeback as can be seen in training pictures posted by the club's official website. Sokratis is also back though not in full training yet. The Greek defender fell and injured his ankle ligament in the first half of the Gunners' FA Cup loss to Manchester United in January and has since missed the Cardiff and Man City ties. He has shown up earlier than the predicted time and if no relapse is experienced, he should be available for selection soon but not as early as this weekend. Another player that has been missed in the squad is Granit Xhaka. The Swiss international sustained a minor groin problem shortly before the trip to the Etihad Stadium, prompting his withdrawal from the team. He is now available to contend for a place in the lineup for their next Premier League game. It is almost certain that we will not see Sokratis in action tomorrow but even if Mustafi and Xhaka do not travel as well, it is still good to have them back at this crucial point in the season. Arsenal will be hoping to get back on track with a win following their drop from fourth to sixth place on the league table. Man United have now leapfrogged them thereby reducing their chances of a top four finish. A clash away in Belarus against BATE Borisov in the Europa League where the North London club's only hope of winning silverware for the season lies will follow next Thursday.